Join Hospice of Santa Barbara on Wednesday, Jan. 17 from 5:30 to 7:30 pm for a wine and hors d’oeuvres open house reception for SlingShot’s art exhibition at the Leigh Block Gallery. 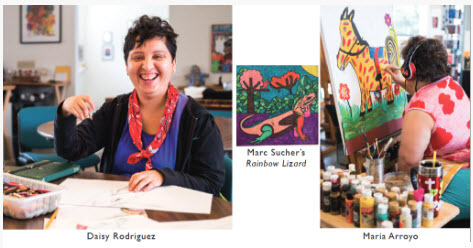 SlingShot, an art gallery designed to encourage creative expression, is home to artists throughout the community with developmental disabilities. Guests have the opportunity to support their local artists, who will be selling their work at this unique event. SlingShot will donate 25% of its total sales to Hospice of Santa Barbara. The exhibition runs until March 15. Since 1974, Hospice of Santa Barbara has provided compassionate care and programs to those suffering from life-threatening or terminal illness as well as the bereaved.